This post is sponsored by my great friends at Borden® Cheese, but the thoughts and opinions here are all my own – just as always. 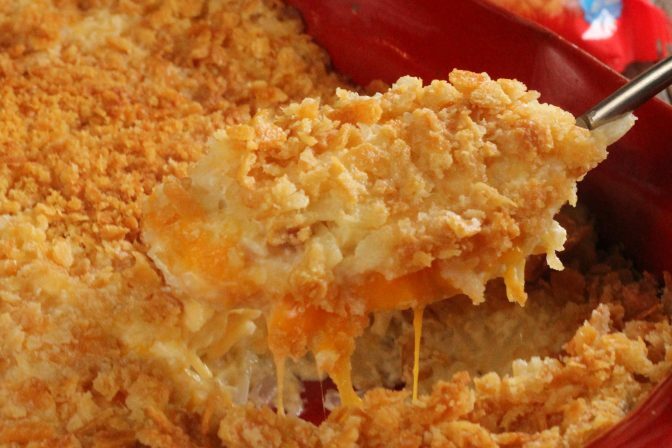 Hash Brown Casserole is a holiday staple on our table. I can’t remember a Thanksgiving or Christmas where this dish wasn’t included. Actually, that’s not 100% true. I can remember when it wasn’t included, because prior to my wife joining our family gatherings, I only knew hash brown casserole as the stuff that you got at Cracker Barrel. Seriously. For whatever reason, the dish that many families rarely celebrate holidays without, had just never made it to the table in our family. Heather made it that first year and it’s been a part of the menu ever since. This cheesy perfection is just about as important to the menu as turkey is to Thanksgiving. I get to thank my sweet wife for quite a few culinary contributions, actually. Pecan Chewies, Kentucky Pecan Pie, and this amazing casserole all came to the family by way of her. This humble casserole is so easy, but so tasty. 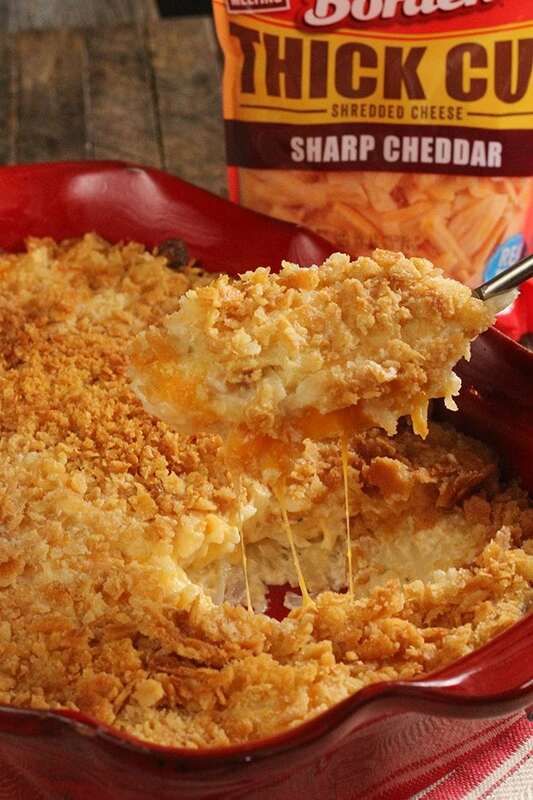 It’s only made better by using new Borden® Cheese Thick Cut Shreds. Y’all know how much of a Borden® Cheese fan I am. 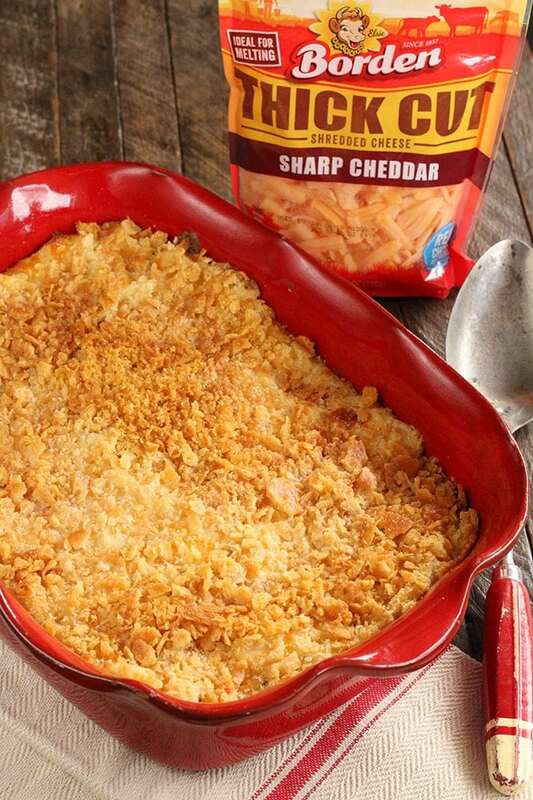 Not only is it crafted with high-quality wholesome ingredients and is the product of more than 8,000 family farms across the country, but the new Thick Cut Shreds are the perfect casserole complement. And I love me some casseroles. This cheese doesn’t get lost in the ingredients like finely shredded cheese does. This stuff melts beautifully, but you know it’s in there. You’ll get the perfect bite of cheese and endless cheesy-pull perfection. I’m rarely wowed by new products, but this is probably my new favorite product in quite a while. I know I’m railing on about cheese, but I just really like this stuff. And while we often say dishes like this Cheesy Hash Brown Casserole make the holidays, the truth is that the holidays just wouldn’t be the same if we weren’t surrounded by our family and friends. They’re the most important part of the season. GIVEAWAY: That’s why my friends at Borden® Cheese are helping folks across the country get home for the holidays by awarding more than $100,000 in prizes to go towards travel fare. Through this national contest, winners will receive a $500 VISA cash gift card to be used toward the cost of airfare, train tickets, rentals cars or other transportation to help folks get home to celebrate the holidays with their families. To enter, visit BordenHomefortheHolidays.com and share why it’s important to you to get home for the holidays this season. The contest runs through Friday, December 8th. Winners will be notified on December 11, 2017. Right now you can also print a valuable coupon for your next Borden® Cheese purchase! Preheat the oven to 350°F and lightly spray a 13X9-inch baking dish with nonstick cooking spray. In a large bowl, combine the cream of chicken soup, sour cream, onion powder, salt, and pepper and mix until well combined. Add the hash browns and cheese and mix until combined. Spread the mixture evenly in the prepared pan. Sprinkle with the crushed crackers and drizzle the butter over the top. Bake for 50 to 60 minutes or until golden brown and bubbly around the edges. Allow to rest for about 5 minutes before serving. CONSUMER: Limit one coupon per purchase only on product(s) indicated. Cannot be combined with any other coupon or other offer. Original coupon only. Void if copied, transferred or sold. Any other use constitutes fraud. Consumer pays sales tax. RETAILER: Eligible retailers will be reimbursed face value plus 8 cents if redeemed in accord with coupon terms and our redemption policy. Cash value 1/20 of 1 cent. Void where restricted. You may be required to show invoices for inventory to cover redeemed coupons. Send to Dairy Farmers of America; DFA (#1173), NCH Marketing, P.O. Box 880001; El Paso, TX 88588-0001. ©2017 Dairy Farmers of America, Inc. Borden and Elsie trademarks used under license. Borden® Cheese is made by Dairy Farmers of America, Inc.
Ummmm……did I miss the giveaway? STACEY!! I love everything about this!! The recipe (for sure… hello? 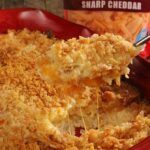 cheesy hash brown casserole? all day long brother. ALL DAY) but this is an amazing giveaway. I know so many people who need a chance like this and kudos to Borden for thinking like this, for putting families first. I will share the snot out of this!! Thanks, friend!! Isn’t this an awesome giveaway??? Made this for the 1st time for Easter. It was a huge hit, especially with the men. Making again today for a party. Love hearing that everyone enjoyed it! There’s no higher compliment than hearing you’re making it again! I’ve been making a very similar recipe for years. However I’m wondering if there is a way to do this in the crockpot and waiting until half way or 3/4 the way before adding the topping. Thoughts? Crockpot dishes are so much easier for work functions when you don’t have an oven accessible. I’ve done it in the crockpot, but it’s nearly impossible to keep the topping from getting soggy. It’s still delicious, but lacks that crunch.